An access key is a character that the user can press, in combination with the Alt key, in order to activate or give a control focus. Controls that the user can interact with and that have their own label typically can define their own access keys. (E.g. A Button). 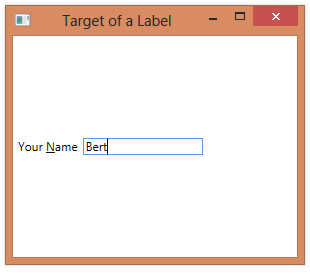 Controls that don’t have their own label can be activated or receive focus by using the access key of a nearby Label. When the user presses Alt+N, the TextBox gains focus (and the user can then begin typing to enter their name). Software developer in the Twin Cities area, passionate about software development and sailing.